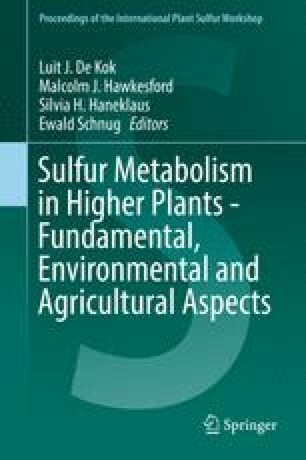 Sulfur is an essential nutrient to all plant species. Plants assimilate sulfur in a well-described pathway, which has been taken up by roots. Regulatory mechanism has been the subject of many research papers. However, recent studies highlighted differences between crop plants and the model plant Arabidopsis thaliana. Our work focuses on the identification of genes involved in the sulfur metabolism in the Vitis vinifera genome, and their response to sulfur deficiency and other abiotic stress endured by grapevine in the field, namely water stress. Here, we describe the identification and brief characterization of the first assimilation enzymes involved in the sulfur pathway, the enzyme responsible for sulfur activation, ATP sulfurylase (ATPS), and the two enzymes that reduce sulfate to sulfide, Adenosine 5′-phosphosulate reductase (APR) and Sulfite reductase (SiR). A reduction was observed in the number of ATPS and APR isoforms identified in V. vinifera genome when compared to A. thaliana or Glycine max genomes. Two ATPS isoforms were present in the Vitis genome, of which only ATPS1 transcript was detected in the tested tissues, and one APR isoform, suggesting an absence of redundancy in the role of both enzymes. ATPS1, APR and SiR transcript level was up-regulated in response to 2 days exposure to sulfur deficiency in V. vinifera cell cultures, which was completely reversed by the addition of GSH to the culture medium. Apparently, oxidative stress triggered GSH has a pivotal role in the regulation of ATPS1, APR and SiR transcription level, since their up-regulation was observed in mRNA from field grapevine berries under water stress, which is known to induce oxidative stress.